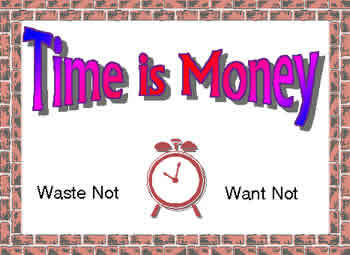 Time is Money, isn't it? Sam was perhaps the wealthiest member of the congregation. Some would doubt that, they might claim, he isn't really a member; a member comes and participates. Sam never has time for that, Time is Money, Sam claims. It was his motto, he had it hanging on the wall of his office. Sam was always too occupied with his business, his factory, and his investments to have free time to occupy himself with communal affairs. The rabbi gave up asking him to help on the various mitzvah campaigns. Sam would just give a nominal contribution and tell the rabbi that he doesn't have the time, "Time is Money" you know. Sam needed the time to look after his business. If he did not tend to it, who else would? Sure Sam came to synagogue on the Sabbath. He spent most of his time speaking with his few friends who were also wealthy. It was worth his time, for they had money to invest, and his business was always looking for new investors. He managed to put in his minimum to the services, whispering to his chosen few friends about the week's market results - what to buy and what to sell. Everyone knew that Sam had no real interest in his religion, yet he continued coming, maybe for nostalgia. His children had long stopped coming. His son attended college became an offbeat artist, rumors have it that he tried drugs, but now is reportedly off the stuff. He was living with a shiksa, but now stopped, he is trying living with a male friend now. Sam does not talk about him. His daughter, thank G-d, married a nice Jewish man. Sam wanted him in the business, but after less than a year, he quit. He could not take Sam's pressure. He now works two jobs while trying to become a pharmacist. They come to visit very infrequently. They want their own life. Sam rarely speaks about them. Sam's wife doesn't like to participate in the shul's sisterhood. She prefers looking for bargains at the more exclusive stores in town. Sometimes she used to help out at the office, but Sam's day is a high tense ten or twelve hours. Time is money you know. Sam has all the luxuries, but really shows no real interest in them. This car that car, you want to change cars, call the dealer get a price. Why waste time, its money you know. Even the indigent stopped coming to ask him for money. If they would show up at his office he would refuse to see them with out an appointment (and the secretary was under instructions not to give appointments to those kind of people). "They just waste my time, and you know: 'Time is Money'". If they were to show up unexpectedly at his house, they would be handed a sealed envelope with eighteen dollars in it. That is if they were able to get to his door when he was home. (His wife did not open the door to strangers.) Meetings kept Sam away at night. If you don't reinvest money you'll lose its value. Going across town one evening to make an investment meeting, a speeding truck tried to make a yellow light and slammed into the side of Sam's car as it pulled away from the light too quickly. The car was hit hard on the driver's side. A crowd gathered to help. Sam was unaware of it. For a day and a night, his life was held in the balance. Doctors came in and doctors went out. They conferred amongst themselves while his wife wondered if he would make it through. But fate was on his side, he pulled out. After much treatment and therapy he left the hospital. Sam walked slowly. His quick gate was not to be seen, he now walked with a very slow and unsteady walk, uncharacteristic of a man to whom time is money. Once home, he rested for several days before even calling his office. Yes, he was told, everything is running well. Production is up, profits have been generated, and stocks have gone up. During the time that Sam recuperated in his home, the rabbi came to visit Sam. He spoke to Sam about helping out the week day morning and evening minyan. To his surprise, Sam decided to come and so he did twice a day. The men were surprised to see him and wished him a quick recovery. Sam's being seemed to undergo a transformation. He became more serious about his prayers. He enjoyed being together in the morning and evening with the other men. When he went to his office, his workers were surprised to see that his impatient prodding had stopped. He showed more understanding to delays. No longer did his workers hear the "time is money" chiding from him. He would leave his office early each day to make it to the daily minion. In the mornings, he would be the last to arrive, he wanted to be in the morning minion. Each morning after the prayer service, the men would sit down together to discuss what ever, politics, religion, sports, and have a l'chaim with some cake. One day, one of the regular attendees asked Sam what had happened that now he saw fit to come each day to support the daily minion. Sam replied to him that each day he lived to do the fullest of his life. He believed that time was money and to waste time was a cardinal sin. However as he lie in his hospital bed a hair's breath from death he began to see what was precious in life. Sure money is important, but what can we do with it in the next world. In this life we were put here for a brief length of time. During that time, we must realize that there is only so much we can do. When we get to the next world, what will we use there as currency? The miztvot that we do here. I realized that Time is Mitzvot. Sam did not stop with just talking. Sam, being a man of action, began organizing his fellow congregants to form a free loan society. He took over the building committee and suggested setting up an apartment for visitors that come to stay in the area. Sam still has his factories and investments, but now on the wall of his office is a new sign that Sam had a professional graphic artist make up. It says "time is not money, Time is Mitzvot". Make the most of your time; devote yourself to doing as many mitvot as possible.